I was so nervous to have this conversation. Our field leader was popping over for tea and to map out our first year back in Ireland after home assignment. My husband had a clear vision for what his role would entail and I was in a slight panic. It’s not that I didn’t know what my role would be. It was that I was about to surprise even myself. Ten years ago, when we first joined our organization and excitedly planned out the entirety of our overseas career, I was full-speed ahead. I was a young mother, yet still envisioned a “parallel role” for myself, where my husband Matt had his ministry and I had mine. Maybe our work would coincide, but more likely they would diverge and complement. Our organization firmly supported the wife’s decision to choose her role in ministry. Though my husband was the “primary employee,” they appointed us as a married couple, embraced both of us as ministry workers, and our churches commissioned us both to full-time service. We were “all in,” together. This worked pretty well for approximately 6 months in country. In the throes of culture learning, we were treated and acted as equals. But with two little ones now in tow, pursuing a ministry role outside of the home was unsurprisingly difficult. Then, less than a month before I was to start working with a ministry I was passionate about, I found out I was pregnant. I knew (without anyone ever having to tell me) that I wasn’t going to be “all in.” I was having a third baby, and I was going to slowly moonwalk away from the role I had envisioned for myself. Almost simultaneously an opportunity appeared for us to join a new effort. Even though my husband would be taking the lead, we’d both be expected to contribute. Immediately, he said yes for us both. We soon found ourselves committed to a work we didn’t expect, leaving him frustrated and me hiding my pregnant self under bedcovers claiming morning sickness at 6pm to get out of going. It was uncomfortable and ill-suited. It was hard and we were unhappy. I removed myself from the role that was thrust upon me, and together we plunged into a deeper one of marital and ministry crisis. 1) We thought making a plan would ensure we’d stick to it. In prefield training, we filled out a nice little form on “wives roles.” It was never a question that my husband was the point person, but as his “+1,” I had some flexibility. We both agreed on what our perceived roles would be and we even signed on the dotted line to make it look super official. Then we threw it out the metaphorical window. When he volunteered me for something, I chafed at the assumptions. When I ended up pregnant, I got angry with him for not holding up his end of the bargain. 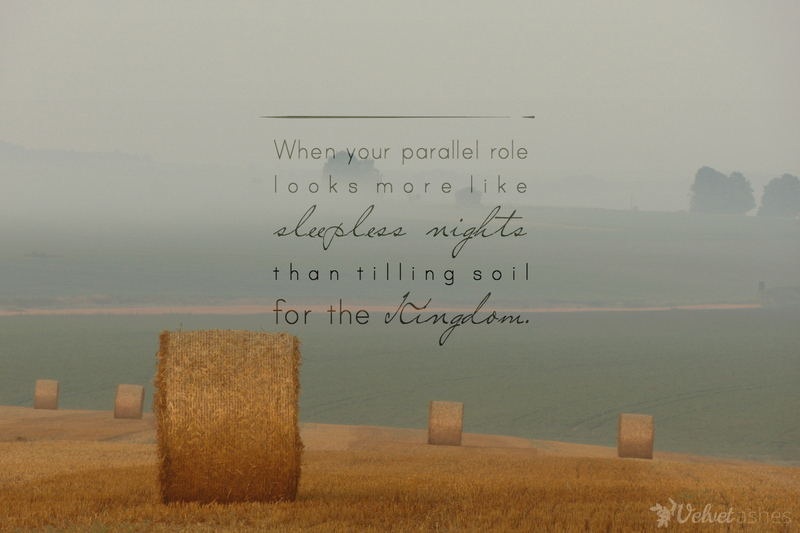 My parallel role looked more like sleepless nights and anxiety-filled days than tilling soil for the Kingdom. 2) We were too anxious to fulfill roles others chose for us. I think both singles and married couples can relate to this. We are so readily and happily available to do the work we’ve been waiting years for, we may find ourselves jumping in with both feet without more than a precursory glance towards prayer and counsel. When Matt said yes for us both, I recoiled. Where was my role in this partnership? And how did the church see me? Are we really two for the price of one, and if so, who is the one holding the lien on my worth? 3) I didn’t seriously consider the role I was already in. The truth is, my 24/7 role is that of Mom. We had itty bitty ones and though I needed a dose of life outside the four walls of our cluttered semi-detached house, I was still their primary caregiver. Like it or not, we came prepackaged with roles. And in my rush to find a role in the culture, in the ministry and outside of our family unit, I was placing an unrealistic burden on myself as a “cross-cultural worker” when being a “cross cultural wife and mother” is already pretty darn hard. Which brings me to 2013 and that conversation with our field leader. The role I still secretly held on to was making way for a new one: cultivating a thriving family after an extended season of upheaval. I could have gone full-speed into a formal ministry role, but God was asking me to – this time, willingly – surrender that vision for another one. He was encouraging me to rest in Him in the roles He had already set out for me, and to wait on Him for new ones, in His timing. But the times, they are a-changing. Those three little ones are now all in school and a role shift is about to take place again. I don’t know exactly what it will look like, but I know myself and my limitations better, and I know now that it’s not the role that matters. It’s not even the task at hand. 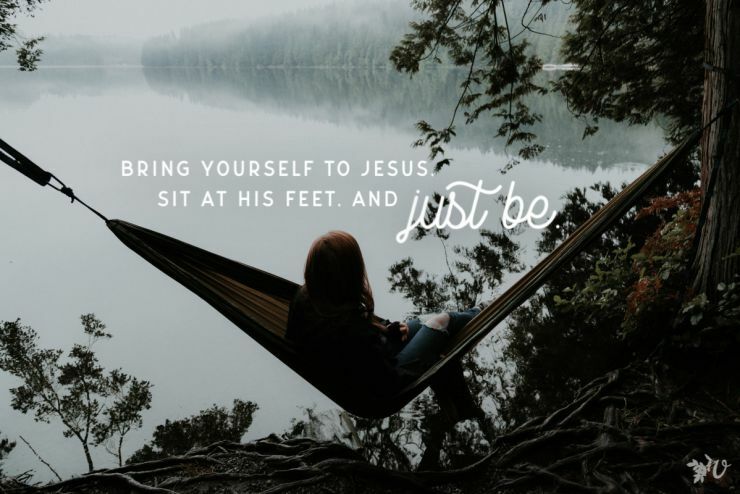 It’s the One who longs for me to sit as His feet and listen. 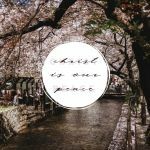 “Martha, Martha, you are worried and bothered about so many things; but only one thing is necessary,” Jesus says. He will show me what is better. And I can’t wait. How is it going for you in balancing and fulfilling your roles? Are you struggling to find the time to do the one thing that is necessary? To sit at His feet and listen? Can we offer you a warm invitation to slip away for half day to do just that? Velvet Ashes has crafted an online retreat just for you, right where you are. And guess what! Registration opens later today! Check back for a special 2nd post today! I think it’s hilarious that you actually signed on the dotted line. 🙂 “But the times, they are a-changing.” I really relate to that. I’m still homeschooling, but my kids are older now. They still require LOTS of hands-on teaching during the week, but to bring life full circle here, I’ve been able to ease back into youth ministry on weekends for the last year or so. I am LOVING it. Rejoicing with you in all seasons of the motherhood/ministry balance. Thank you for sharing this! 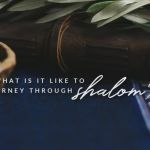 I’m a mom of two on the field, wondering how to “do it all” and really needing to take time to discern my ministry role outside my home and to move toward God’s best for my family. Hi Anndee! Thanks for commenting. I wonder that, too, sometimes. And it’s always evolving… what has been best for us before is not always the case later. And as someone who’s always itching to do “something else” besides being “just a mom,” it was a true time of stretching when God told me that was enough. Praying you find some rest and encouragement as you discern your role! On my own life, I struggle from time to time with this because I don’t see any changes in the near future, if ever. My daughter has special needs and it requires quite a bit of my time to care for her. 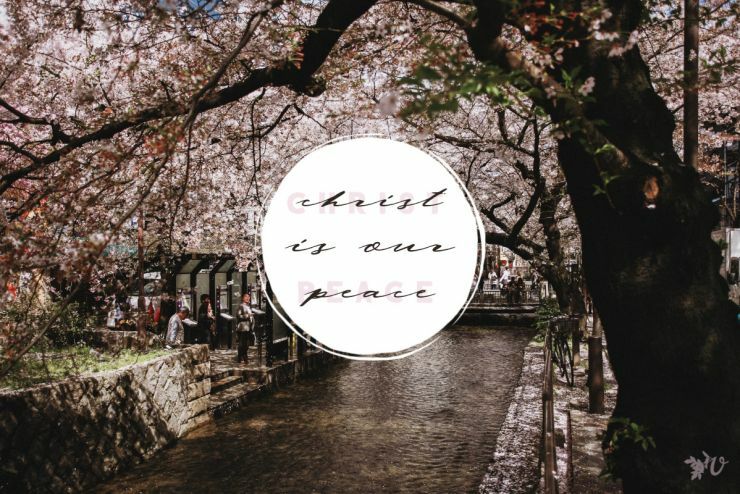 Today, I’m okay with it all – but there are days/seasons when I cry out to God about how this was not what I had planned when I moved overseas to build up his Kingdom. (sometimes I’m kind of snarky with God…thank goodness for grace and new mercies every morning, but also for those lightening bolt moments where He gets my attention when I’m being a little too much – know what I mean?) Anyway, to sum it up I’m learning (work-in-progress) to be content with what role that God has put me in during my life here on earth. Oh, the snark! I’m right there with you. Thankfully, I think He can take it. And probably chuckles at us from time to time! I’m thankful for those lightning bolt moments, too. Thanks for sharing these words here with your friends! I’m so glad when something God has been teaching me – slow as I am to sometimes get it – speaks to others. “being a “cross cultural wife and mother” is already pretty darn hard”. Yes to this. This is such an important story to tell. So glad you are listening to the Spirit’s callings on your life and finding the courage to say yes, even when it’s not always what you or others expected. My heart resonates so much with this. My husband and I started our overseas career- just the two of us, no kids. When we had our first born, eleven years ago, my whole world turned upside down, and I frantically tried to figure out how to keep up with our work roles and ministry with a little one in tow. I didn’t pull back and I didn’t slow down- I hauled through more language learning (second country/second assignment), finding service opportunities in the medical field and serving our organization in a myriad of ways. Then number 2 came along, and I just kept pushing through. When number 3 joined our family, I actually added more work onto my plate in a desperate desire to stay involved and have purpose, along with meeting the needs I saw around me. My husband was concerned, especially when I started putting pressure on him to ‘do more’ (even though he was wearing about 3 different ‘hats’ and had several demands on his time). I was saying ‘yes’ for the both of us without even talking to him about it first…. so we started to collapse on the inside. Overwhelmed, tired, hurt, and starting to break, I realized not to long ago that my drive to keep pace with the real or unreal expectations ‘out there somewhere’ was becoming destructive. Our family was somehow thriving in the midst of it all- especially our kids, thank God, but inwardly my husband and I were barely surviving. 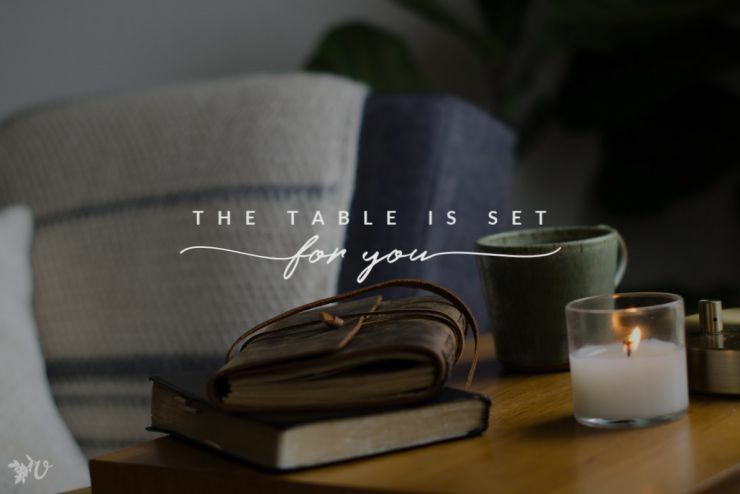 We are half way through our sabbatical year and I’ve enjoyed sitting at the Lord’s feet… just waiting and listening. It’s new for me, and I know He is already doing something new in the life of our family, and I love it. I don’t ever want to go back to the way I was operating only a year ago. Even though I was genuinely trying to serve, and be a blessing, the pressure I placed on myself (and my husband) was just too much. I’m so thankful for His Grace, and also for a safe place like VA where people can share their stories and relate on so many levels. Monica, thank you so much for your comment. 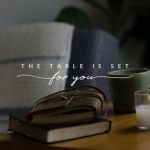 It sounds like you have such a heart for your people, your ministry and your family, I can see how difficult it would be to know when to slow down – and to buckle down and do it. Thankful that the Lord is giving you that time to rest at His feet, and that you’re thriving in it! Karen, fresh mom/overseas workers like me are greatly encouraged by this post and we appreciate the reminder. It’s so hard to accept that I often “place an unrealistic burden on myself as a ‘cross-cultural worker’ when being a ‘cross cultural wife and mother’ is already pretty darn hard.” I certainly don’t need that burden!